A quick look at the week ahead...we have five straight nights of music at The Barns this Tuesday through Saturday, with tickets still left for a couple of those shows. Tuesday night, January 30, Buckwheat Zydeco takes the stage and tickets still remain. The same goes for Wednesday night, January 31, when John Hammond performs. Click on those links for show details and to order tickets online. You can also call 877-WOLFTRAP or stop by The Barns box office. Then we've got three nights of sold out shows: International Guitar Night on Thursday, Jeff Daniels on Friday, and Riders in the Sky on Saturday. You can always check for last minute ticket availability at wolftrap.org or by calling (703) 255-1868. -->Tonight's Discovery Series show with Parker String Quartet is a Weekend's Best pick in today's Washington Post. -->Wolf Trap's use of new media is highlighted in the lead blurb of today's Hypebot's New Music Business Briefing. -->John Hammond performs at The Barns at Wolf Trap next Wednesday, January 31, and a review of his new G. Love produced CD, "Push Comes to Shove" appears in today's Washington Post Weekend section. -->The upcoming two-night-stand at The Barns at Wolf Trap by Cherish The Ladies on February 27 & 28 is a pick in The Washington Times' "February guide to the Arts." -->Finally, a review of this past Wednesday night's John McEuen performance at The Barns appears in today's Washington Post Style section. We've added even more tracks to the Wolf Trap Radio playlist since Marc put together his article. At that time, we had about seven hours of music in our playlist on a random rotation and, with some additions to the playlist over the past couple of weeks, we now have close to thirteen hours of music in rotation. Those tracks are all in shuffle mode and highlight performances from The Barns at Wolf Trap '06-'07 season (we'll start airing music to highlight the Filene Center 2007 summer season in late March/early April). In addition to that playlist, we currently have a couple of radio shows on the schedule as well. One features John McEuen and the other features John Eaton. You can read more about both of those programs in this blog post from last week. You can launch Wolf Trap Radio by clicking on the menu item to your left or from this page at wolftrap.org. In Friday's Weekend section, the latest release from Wolf Trap Recordings, John Eaton's "Richard Rodgers: One Man and His Lyricists," was reviewed by Mike Joyce, while Richard Harrington did a full page feature on John McEuen, who plays The Barns this Wednesday, January 24. In the Sunday Post, J. Freedom du Lac highlighted John Jennings and his upcoming Saturday, January 27 Barns performance in Here & Now, while Marc Fisher included Wolf Trap Radio and our podcasts in his Listener column "Arts Presenters Hope Podcasts Click With Patrons." Grammy-winning blues legend John Hammond releases a new CD next week and makes a stop at The Barns at Wolf Trap on January 31 as part of the supporting tour. The new disc, entitled "Push Comes to Shove," was produced by G. Love and features a dozen songs, five of which were written by Hammond. Check out this press release on PR Newswire for more on the new album and tour. You can also hear tracks from the new CD on Hammond's MySpace page. As of this posting, tickets to Hammond's performance at The Barns are still available. Call 877-WOLFTRAP, visit wolftrap.org, or stop by The Barns box office for tickets. We've been adding more music to Wolf Trap Radio, which is currently playing a mix of songs to highlight this season's performances at The Barns at Wolf Trap. We've also added a couple of radio programs. John McEuen visits The Barns on Wednesday, January 24 and we're currently airing a half-hour radio show that he put together. His show airs every day at 2:30pm and 7:30pm. And we've added a program by jazz pianist John Eaton that will air on Thursdays at 1pm (beginning January 18) and then again on Saturdays at 1pm. The show features both music and commentary from Eaton and his guests, with the first installment focusing on the music of Richard Rodgers as we air the Wolf Trap Recordings release "John Eaton Presents the American Popular Song: Richard Rodgers - One Man and His Lyricists" in its entirety. Johnny Winter plays The Barns on Janaury 19. It's sold out but you can always check back for last minute ticket availability for any show by calling (703) 255-1868. The current issue of Opera News features an article on WTOC alumn Elizabeth Futral (1991). For a look at all the WTOC alumni, dating back to its inaugural season in 1971, check out this list on wolftrap.org. Among those names, you'll find Denyce Graves, Alan Held, Dawn Upshaw, and many others. Mike Joyce has selected "January's Best Jazz Concerts" for washingtonpost.com and John Eaton's January 20 The Swinging Thirties performance at The Barns at Wolf Trap has been highlighted on the list. Unfortunately, for those who don't have tickets yet, the show just recently sold out. However, at the time of this blog post, tickets still remain for Eaton's March 24 The Fabulous Forties performance. He plays piano with Mary Chapin Carpenter, wrote songs for Linda Ronstadt and Tom Jones and, as a member of the "Starland Vocal Band," recorded one of the defining hit singles of the 1970s "Afternoon Delight." Now songwriter Jon Carroll strikes out on his own with a new CD and joins us for an in-studio performance. Jon Carroll plays The Barns at Wolf Trap on Friday, January 12. As of this posting, there are still tickets available. If you can't make that show, Jon will be back at The Barns on Saturday, January 27 to join John Jennings on stage. With the nation celebrating the life of the late President Gerald R. Ford this seems like a good time to share this photo from Wolf Trap's archives. 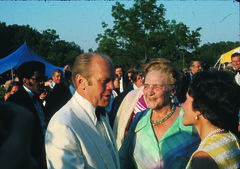 In the undated photo above, President Ford is pictured with Wolf Trap founder Catherine Filene Shouse (center) and an unidentified guest. President Ford appointed Mrs. Shouse to the Commission on Presidential Scholars in 1975. Two years later, he bestowed upon her The Presidential Medal of Freedom, the highest United States civilian award.